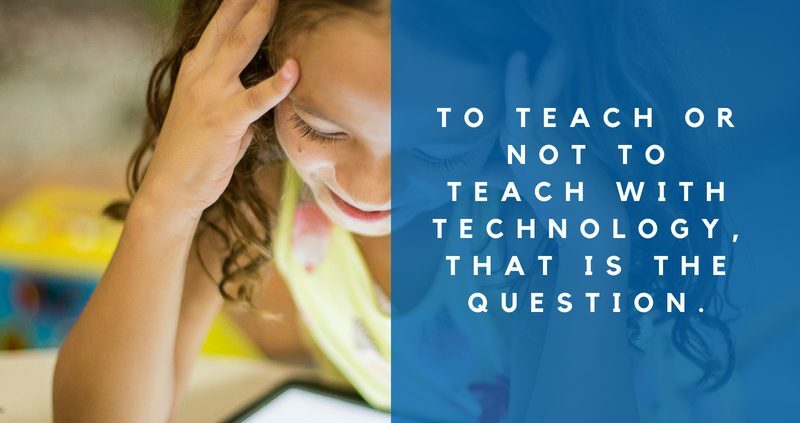 To teach or not to teach with technology, that is the question. At the risk of losing my job let me say that there is too much hype about ‘teaching with technology’. Seriously – we’ve been doing this since the dawn of mankind. It’s just the technology and the way we use it that changes. Dare I say that I have seen dipping pens, fountain pens, and – heaven forbid that the art of cursive writing be ruined – the ball point pen. In fact the meaning of the word ‘technology’ itself has changed. The Greek word “tekhnologia” originally meant “systematic treatment of an art, craft, or technique” (British dictionary). It was in 1859 (Do the math! 157 years ago!) that it was applied as “the science of the industrial and mechanical arts” (Etymology Dictionary). Most modern subjects now have different definitions for technology. I started teaching with a blackboard and chalk which is, you have to agree, a scientific method of achieving a practical purpose. If you asked me what technology (pre digital) changed my teaching I have to say – the overhead transparency machine. A veritable PowerPoint operated manually. The OHT was a most versatile machine enriching lessons with media as never before and providing a stage from which I could wax lyrical without ever having my back to the class. Technology comes in all forms. I taught in a Jewish Day school with a headmaster who, dressed in a white safari suit, habitually strode around the school giving announcements through a red loud hailer. The ensuing crazy chaos was energizing but the technology was oh so inefficient – no Staffroom software in those days. Once I had to hide in a dark classroom as I had temporary caps on my front teeth and looked like a rabbit. I devised lesson plans around slide presentations and video clips – all presented in the dark. The students loved these types of lessons – they sat chewing gum, holding hands and undoubtedly kissing in the back rows. These lessons were entertaining but not engaging – well, not with the subject matter anyway. I could go on – many years of teaching gives loads of material to illustrate what I want to say. So what is it that I am trying to say? New technologies will always be introduced into education and we have to use them appropriately. New technologies may offer greater learning and teaching opportunities that veer away from the traditional. Hallelujah. You can’t solve today’s challenges with yesterday’s solutions. The best type of learning is by doing. Lessons that are learner centric and delivered at the students’ pace far outweigh those delivered by teacher talk irrespective of how entertaining the teacher may be. All of the above creates a daunting task for traditional teachers. Engaging and enriching students using today’s technologies is no less daunting but from my experience far more satisfying. Teachers do want to embrace today’s digital tools especially those that make administrative duties less arduous as well as teaching and learning more effective. More to the point however, students want to learn in an environment that gives them a voice so that they can interact, collaborate, take control and excel in a very fast changing world. To allow excellence to prevail we must contribute to the improvement of teaching by using the capabilities of media and new methodologies and in this way positively influence learning for students. Jenny has enjoyed a successful career in secondary and tertiary institutions both locally and overseas. Her international experience of 13 years centred on teaching within a second language university environment, managing online Learning Centres for exceptional and at risk students and very importantly, providing professional development for faculty and staff within an Educational Technology sphere. She has authored academic journal articles and co-authored a school textbook. She also has experience as the assessment editor of two international examination boards – Scottish Qualifications Authority Equivalency and the Australian VBOS Equivalency Examination. Jenny has experience across many software packages, learning management systems, and teaching environments. This experience, together with a Master’s degree in Education Technology from Southern Queensland University, supports her involvement with instructional design expertise for faculty and the implementation of e-learning systems in her university. Jenny is based in KwaZulu-Natal and is an e-learning consultant offering a number of workshops related to online learning and technology adoption, the product trainer and support officer for a software such as Blackboard Learn and Turnitin. She travels throughout South Africa and sub-Saharan Africa to offer workshops related to teaching, effective use software proffered by Eiffel Corp and e-Learning adoption. http://www.mystaffroom.net/wp-content/uploads/2018/06/4.jpg 800 800 joshkraus /wp-content/uploads/2018/06/Staffroom_Logo_White.png joshkraus2018-06-05 18:33:532018-06-10 18:54:00To teach or not to teach with technology, that is the question.